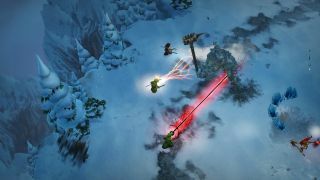 Magicka 2 will release May 26, confirms the cheeky trailer above. The series' unique improvisational approach to attack combinations will arrive with a new artifact system, which introduces the ability to dramatically change the way the game plays. Artifacts can be used to make your wizards portly or to add canned applause, which is sure to inspire a boost of confidence as you kill things spectacularly. On the list of actually useful and not very funny things, you can tweak pretty much every gameplay element: enemy strength, magic types and much more can be customized, but artifacts are a finite source so you'll need to choose wisely. Emanuel played Magicka 2 late last year and described it as "more, slightly prettier Magicka". You can already pre-order it on Steam, where a Linux version is promised later in the year.